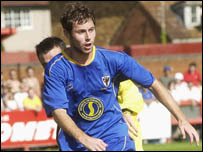 AFC Wimbledon set a new English senior record after a 1-1 Ryman Division One draw at Bromley saw them extend their unbeaten league run to 76 games. Rob Ursell was the hero - curling home a superb equaliser after Turu Henriques had put Bromley ahead. Manager Dave Anderson said: "This is a fantastic achievement and everyone who has been involved with the club should feel very proud." The result meant they beat the previous mark set by Cornish side St Blazey. Anderson added: "They've been playing under immense pressure for the last few matches. Now the record's been broken, I hope we can get back to winning games."